Beef Cuts: lions, shanks, briskets and chuck – if all the different cuts confuse you when deciding what to cook, this post will help. It includes a collection of beef cut charts to help you buy the right cut of beef for the right job, whether that’s grilling, stewing, braising or roasting. Follow this beef cuts guide and you’ll be acting like a butcher in no time. A cow is broken down into what are called primal cuts, the main areas of the animal which include the Loin, Rib, Round, Flank, Chuck, Sirloin, Brisket and more. These primal cuts are then broken down into sub-primal cuts, including specific steaks and chops: flank steak, flat iron steak, filet mignon, rib eye. As you’ll see below, there are many different cuts of beef to learn. LOIN,SHORT LOIN,STRIP LOIN CUTS: these are usually leaner cuts of beef, best grilled or fried and work better with high heat. It’s the T Bone and Porterhouse Steaks, the Tenderloins, cuts of meat that respond better to dry heat cooking. SIRLOIN CUTS: Filet Mignon, Bavette, Tri-Tips, Strip Steak and Roasts – coming from the rear of the animal, these are also leaner cuts, certainly not the best beef choice f you want to slow cook. The Sirloin family is best for grilling, skillet and stir-fry with high, dry heats. RIB CUTS: Ribeye Filet, Ribeye Cap, Ribeye Steak. These cuts are getting fattier, meaning some of them are better for slow cooking and roasting. Not all the cuts in the rib family work well with slow cooking methods: Ribeye Steak, for example, will always kick better grilled or fried in a skillet. CHUCK CUTS: Blade, Chuck Eye, Country-Style Ribs, this is where the slow goodness starts to come to play with some good cuts for pot roasts. Don’t get us wrong, you’ll also find lots of chuck cuts are good for grilling: Top Blade, Ranch Steak, Shoulder Steak. If you only understand one section, Chuck is the one as there’s a cut for every style of cooking. BRISKET CUTS: You can’t really go wrong with brisket, whether you choose Flat or Point cut – they both want to be slow cooked. For us, Brisket Point works better than Brisket Flat, the flat cut is a bit leaner. Just be careful when slow cooking brisket, it’s a forgiving cut but the margin between delicious juicy and chewy dry is small. ROUND CUTS: Coming from the back legs of the cow, this is a part of the animal that usually provides leaner cuts of beef so you need to know your business at this end. Top, Bottom and Eye Round will go well at high heats, the Bottom, Rump and Eye Roast are best for slow cooking and, you guessed it, oven roasted. PLATE & FLANK CUTS: Skirt, Flank, Short Ribs: only the short ribs should be slow cooked over here, the flank and skirt steak will do you best grilled or fried. OTHER CUTS: Beef cuts come in all shapes, sizes, textures and tastes. ‘Other’ covers anything that doesn’t fall into the rest of the main families. You have Stewing Steak, Burgers, Corned Beef, Minced and Ground Beef in this category. Shanks, which come from the legs of the cow, are probably one of the most interesting cut included in other, perfect for slow cooking. One of our favorite cuts of cow is the cheeks. Beek cheeks are an often overlooked piece of meat that many top chefs utilize in their restaurants . One of the most forgiving cuts when cooked slowly and a simple piece of meat that will change your pot roast game for the better. The recipe below shows you how. Take the beef cut chart to the next level, this beefy encyclopaedia is this simple collection of 60 different beef cuts from across the whole cow. A great beginners cheat sheet for for meat treats. As you see, even though there are many different types of cut, they all fall within a small family group. Anthony Bourdain offers up his tips on choosing a steak cut. This chart is great because it focuses is on some of the best cuts of beef with details on what should be looking for when you’re actually purchasing beef. There’s a good explanation of the differences between prime, choice and select beef. 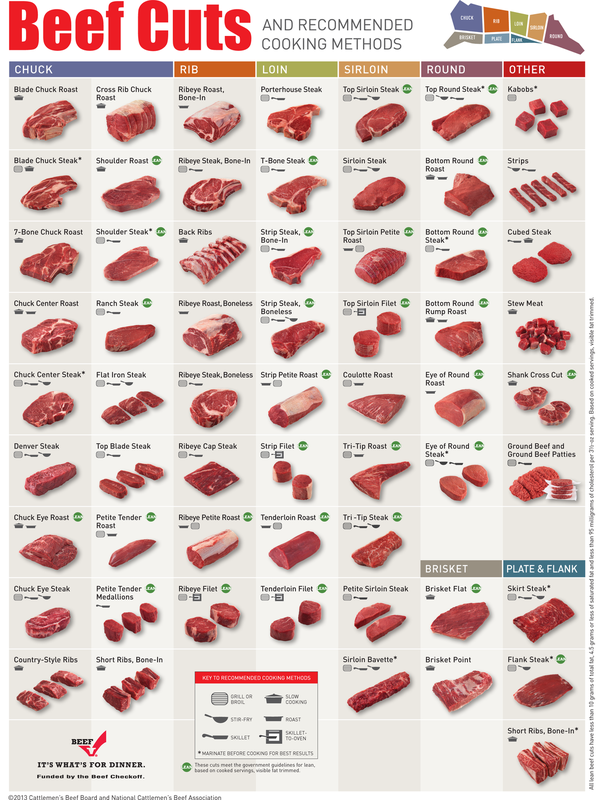 If you’re someone who has your go-to beef cut checklist in order, perhaps you can take some insertion from this selection chart of underrated beef cuts. There are six different cuts listed with great details on how you should cook them.